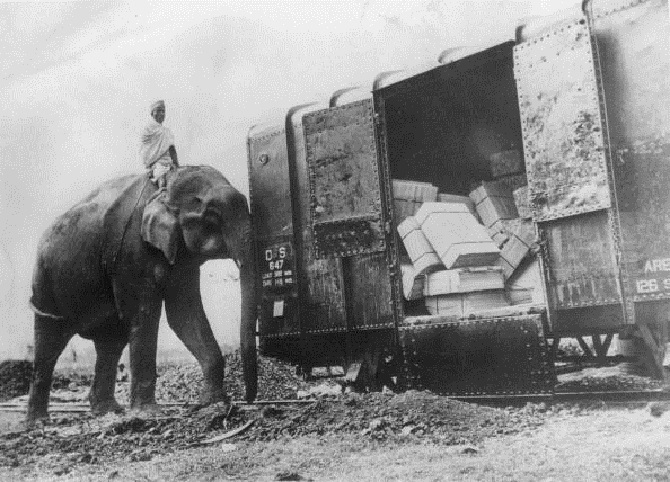 IMAGE: On the Bengal and Assam railway in Bogopani in 1945. After a rapid reconnaissance in 1947, it was decided to link up the metre gauge systems of the Oudh and Tirhut Railway and isolated parts of the Assam Railway. Photograph: Keystone/Getty Images. "Of the engineering projects completed during the post-war period, none has been so remarkable as the ARLP. Its completion in record time provided the vital link between Assam and the rest of India, which was suddenly snapped by the Partition. "After a rapid reconnaissance it was decided to link up the existing metre gauge systems of the Oudh and Tirhut Railway and isolated parts of the Assam Railway (both now part of North Eastern Railway). The proposed railway was to connect Kishangunj on the OTR with Amingaon in Assam. "During a period of less than two years, despite adverse weather and health conditions, a 142-mile-long link was completed. It was opened to goods traffic on December 9, 1949, and to passenger traffic on January 26, 1950, the Republic Day. "The Assam Link consists of four different sectors that had to be built, on which modern methods were employed with good results. "The first, Kishanganj-Siliguri, involved the conversion of 66 miles of existing two-inch gauge to metre gauge. "The next section, Siliguri-Bagarkote, proved to be the most difficult one. Besides, the provision of a new metre gauge connection of 22 miles, a major bridge over the turbulent Tista river, had to be constructed. "The next section, between Madarihat and Hasimara, though only 8.5 miles long, passes over the deceptive Torsa river, which is bridged by nine spans of 150 feet each. "The fourth section, linking Alipurduar and Fakiragram, was completed with no special difficulties. "The total cost of the Assam Rail Link was about Rs 9.3 crore, working out to Rs 6.5 lakh per mile. The railway runs through the Purnea district of Bihar for 40 miles, the Darjeeling and Jalpaiguri districts of West Bengal for 78 miles, Cooch Bihar in West Bengal for five miles and Goalpara district of Assam for 22 miles." A northeastern mountain railway that existed 125 years ago! I can't resist quoting a bit about Calcutta. "For any big undertaking in eastern parts of India, Calcutta is the obvious headquarters; but that great city, and, in particular, the railway world there, would brook no new organisation due to congestion already existing. At the same time it was clearly appreciated that without an office in Calcutta for supply of stores and to coordinate activities with other railways and outside administrations, work on the projected railway with any speed was not possible. Some accommodation in the business centre of Calcutta had, therefore, to be found. "Entry into the Koilaghat office of the old B A Railway was secured early in December 1947, with permission to use two small rooms temporarily and gradually it expanded into a fair-sized office within that building." "Entry" being "secured" sounds like an offensive incursion, which it probably was. "(An) Oriya labourer is essential in this part of the country for high banks, long leads and difficult soils. He is a born artist at this work and his final dressing of formation to proper profile is almost perfect. Earthwork labourers, like the army, march on their stomach. Oriyas eat rice and not wheat. Arrangement for rice must be made for them and in adequate quantity." Perhaps, I should also quote from N Gopalaswami Ayyangar's Railway Budget speech on February 21, 1950. "The economic life of these areas came to depend on the goodwill of the Pakistan government in continuing the free use of transit facilities through East Bengal. This was a risk which, the government decided, should not be allowed to remain for long. "The Assam rail link was, therefore, planned in the year 1947 and work commenced thereon in 1948. It was anticipated that under optimum conditions, the project would be completed by April 1, 1950, but as a result of the uncommon energy and skill displayed by our railway men, both engineers and other workers, in difficult and unhealthy terrain, the line was completed and opened to goods traffic on December 9, 1949, and to passenger traffic on January 26, 1950. "This achievement was timely in enabling us to deal with the transport difficulties created by Pakistan action in recent months. "The original plan was to build up the capacity of the line for carrying traffic gradually; but in view of the Pakistan government taking one step after another for the purpose of creating economic difficulties for India in this region, and holding up traffic in transit, both rail and waterborne, it became necessary to step up the capacity of the link rapidly to carry all traffic between Assam and the rest of India."